As good review, I have started a repository to track my refresher on design patterns in Java. Keep an eye out and definitely keep an eye out for the same thing but in C. I am a C guy after all ;). The best conference in Ottawa….in my opinion! Check it out, it is very UNIXy and Linuxy: BSDCan 2016. 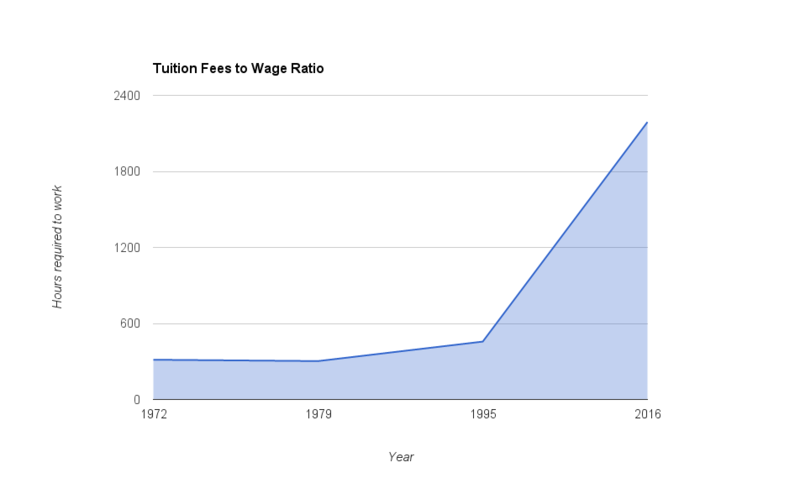 Tuition to Wage Ratio Since 1970. Interesting results after trying to actually sift through sources on news articles and reading comments on CBC news sites about inflation, generation this and that. I seriously think that this graph shows it pretty damn clearly. Here, unlike news articles without listed sources, are my sources so you can check my numbers as published by the faculties/universities themselves. Can we put the rebuttal from a lot of the now older generations claiming that we are “spoiled?” Each generation has its challenges and the populace from each generation is divided differently with regard to income. Not everyone from the boomer generation was rich and not everyone had the same opportunities as everyone else. The same applies to modern times folks. In 1970, you could work 18.75 hours/week for 4 months (summer vacation) and pay for a year of school. In 2016, you must work 136.85 hours/week for 4 months (summer vacation) to pay for ONE year of school, that’s 19.5 hours/day for those 4 months by the way. That gives you about 4.5 hours of sleep, plenty for a young teen! Spread it out over a year? Sure, that’s 45.62 hours/week for 12 months! See the issue folks? Let’s try to stop pretending that “you had it hard too” because education these days is absolutely and insanely out of reach for middle class children to pay on their own. The goal here is to show everyone that the numbers are what they are and that it’s an issue for everyone. I think the article written by the CBC was built to hedge Canadian generations against each other and if you read the comments, that is what certainly happened. Remove Anonymous User accounts – there are 2 Anonymous accounts. Log in to your mysql DB as root or an account with sufficient user admin privileges. That’ll at least bump up security, but I also noticed that we aren’t using any caching available so let’s enable those and let MySQL “settle” for a few days before revisiting tuning again. |__ Pretty fair to start and enable the caches that MySQL offers. As per mysqltuner, we’ll start the thread cache at a small 4, the query cache type “1” caches all queries except for queries with “NO_CACHE” prepended and sets the size to 16MB (>= 8MB) as recommended by mysqltuner. I’ve restarted MySQL and so far, the output from mysqltuner is much, much better ;). See you in a few days! [!!] User ‘@localhost’ is an anonymous account. [!!] User ‘@wordpress’ is an anonymous account. [!!] User ‘@wordpress’ has no password set. [!!] User ‘root@127.0.0.1’ has no password set. [!!] User ‘root@::1’ has no password set. [!!] User ‘root@wordpress’ has no password set. [!!] User ‘@localhost’ has user name as password. [!!] User ‘@wordpress’ has user name as password. [!!] There is not basic password file list ! [–] No replication slave(s) for this server. [–] This is a standalone server.. I have finished editing a quick video that I made when I saw an opportunity to run an HPSI Unichip Stage 2 on my car (once again!). I am currently using a Seletron ChipBox and definitely enjoy it’s additional boost, however, that HPSI tune literally wants to tear your face off any chance it gets. The thing that I take away from the ChipBox is that it is very smooth power that is smoother than most other piggyback tunes that I’ve used (TMC, RRM). The Unichip, however, is a different breed from other piggybacks and can intercept and manipulate signal voltages more than a simple +/- so you can develop your own boost maps, AFR maps and further refine your tune. Of course, the Unichip is still ultimately limited to what the ECU will allow since the Unichip is not the top authority when it comes to operating the engine, that’s the ECU’s job. The TMC and RRM piggyback boxes connect to the Boost and MAP sensors (and a cam sensor for an undisclosed reason). Though, the ChipBox unit plugs into Boost and MAP sensors it also connects to the boost solenoid and I suspect that it is to assist in reaching its target boost levels. Thus, it removes one other trick that the ECU has up its sleeve when it wants to limit boost pressure. As I was making my How To video for the spreadsheet I tracked down a few bugs that left out the rear torsion bar and front stay bar contribution to roll stiffness and thus, impacted the Front Roll Couple calculation. 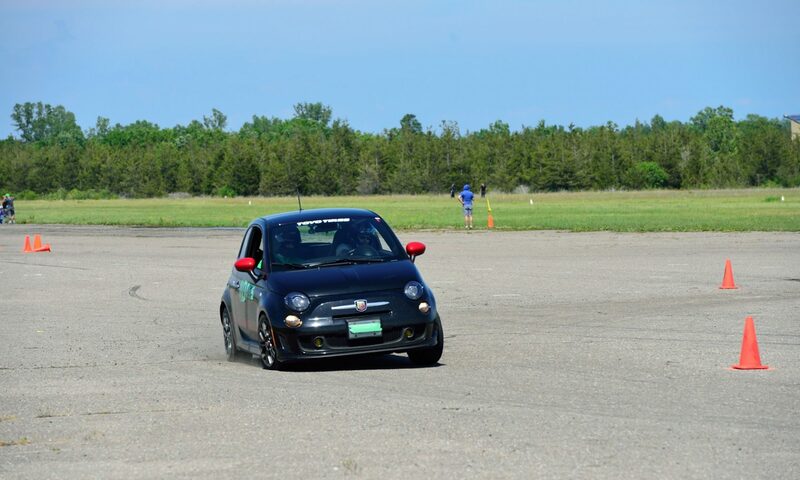 The updated form is here: AbarthSuspensionForm. My friend Stephane Potvin had been running a Minecraft server but was stuck with some reliability issues. I did some work for the start-up scripts but that work was lost when the port maintainer (rightfully so) decided to take a step back and fix up the port. He did a great job in my opinion and left the “start-up” process to be figured out by users. That said, there was still a gap left. The reality is that some of things in the older port used a .lck file and that made things great and portable since you could use whatever the heck you want to wrap the service and start it up, restart it, shut it down, etc. Having said all of that, I present to you my MinecraftWarden to keep the Minecraft application running like it should! Here is a link to my gitlab repo: MinecraftWarden. The only caveats are that we haven’t tested it on his system since I need to bring him a Gigabit switch to connect the server onto his network. Sounds like a permissions issue I think. /me makes some coffee and proceeds to troubleshoot the root cause. 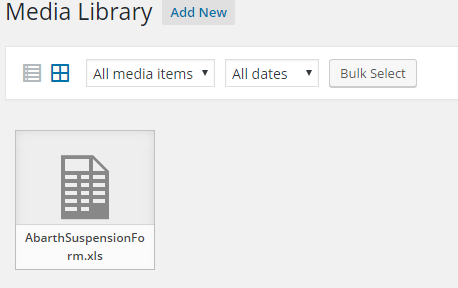 Let us see what is in the wordpress directory and take a look at wp-content’s permission settings. Okay so wordpress is the owner and group, the owner has full permissions and the group has read and execute permissions. Let’s try this, root@Wordpress:/usr/local/www/apache24/data/wordpress # chmod 775 wp-content/, same error. Let’s try root@Wordpress:/usr/local/www/apache24/data/wordpress # chmod 777 wp-content/, voila. Hrmm, I’d be shot if I left 777 and called it a day. Let me check to see what permissions were set when the file was successfully uploaded with 777 in-place. -rw-rw-rw- 1 www wheel 16896 Apr 8 08:45 AbarthSuspensionForm.xls, ah ha! Years ago when I was studying Electrical Engineering at the University of Ottawa, I had the opportunity to dive into learning what makes your car go bouncy-bounce! (Or crash! and Bang!). I held a lead role for the proposal and research stages of designing a Formula SAE car for the purpose of competing against the Carleton Ravens team which by the way, is a very formidable and capable team that has both an IC powered car and an electric powered car! One of the things I found when looking through the maths of suspension design was just how familiar all of the equations were to acoustics. When you look at a speaker and it’s physical characteristics, you look at things like Cms (suspension compliance), magnet force, surround excursion, damping factor and so on. A speaker is a really neat device btw and you should definitely look at it in detail. I took on a personal project to develop some basic maths for the FIAT community, having noticed that there was a lot of guesswork and “try this, try that” going on. I knew from school and my acoustics design experience, that you can select a design target and direct your approach methodically without guessing. It is without further ado, I bring you the v1.0 of the Fiat 500 Abarth suspension design spreadsheet! AbarthSuspensionForm The spreadsheet is directly inspired by the similar looking Fat Cat models on Fat Cat Motorsports’ website. The spreadsheet can be used to determine desired spring rates, target natural frequencies and oversteer/understeer characteristics. I’ll be posting a tutorial video to work through an example and posting that as soon as I can track down the time!